Builder : Kodiak Enterprises, inc . 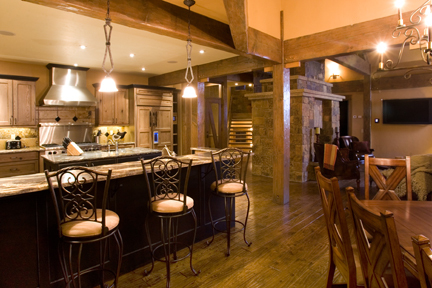 In both design and décor, this contemporary yet rustic luxury home suggests the mining era history of Breckenridge. The top level entry, with slate floors, stone walls and timber trellis, starts your experience as you descend by timber and glass elevator or timber stairs into a truly comfortable environment where you can enjoy life fully. 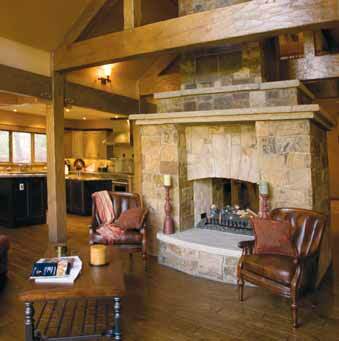 The massive two-sided stone fireplace dominates the great room, while filtered views of Baldy Mountain are enjoyed with a southeastern exposure. Three of five bedroom suites are recessed around the great room. The warm earth tones of stone, timber and wood combine with steel and glass to create a uniquely grand setting. The timber and glass climate-controlled wine room, large gourmet kitchen with stunning granite, dining room for 16 and clerestory timber frame leave a distinct impression of luxury living designed to accommodate the entire family. Descending again by glass and timber elevator or stairs leads you to a comfortable recreation room where two of five bedroom suites are also situated. This second living area includes a theater with leather recliners. It also includes a fully-equipped wet bar, billiards, a cedar sauna, a stone fireplace and an outdoor sports mudroom adjacent to the patio with a hot tub, Fire on Demand and trail access for a short walk to the Quicksilver Lift, The Burro Trail and Main Street Breckenridge. Such opulence defies the well-hidden and highly efficient nature of this home. The Energy Star certification for 82 Victory Lane proves it is 55% more efficient than one could expect from a comparably sized home. Beauty can be found in more than granite, wood and fancy fixtures. From the 93% efficient condensing boilers, heat-recovery ventilation and the advanced sealing package, to the high quality windows and the future solar systems, this home recognizes plainly that energy is finite, and sustainability is the future. From Main Street Breckenridge, travel south to Broken Lance Drive. Proceed west to the “T” intersection. Turn left on Broken Lance Drive. Turn right, or west, at the second right, which is the loop intersection of Broken Lance Drive. Turn right on Victory Lane. • Scalable A/V systems and full-home automation.